From 1 November 2012 there is a new code for tyre labelling across Europe. Once upon a time if you bought a new fridge or maybe a microwave you might expect to see a little chart on the fron (usually A to G) about their environmental credentials and efficiency. Now the same thing has come to the world of tyres. 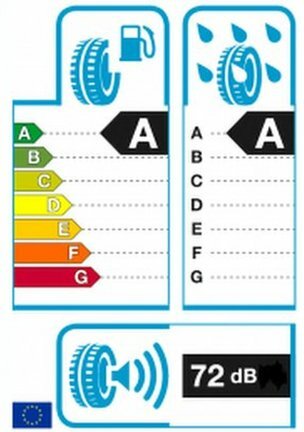 There will be two ratings on tyres, the first is for fuel efficiency and the second for stopping in the wet. There is also a third which is about the noise level of tyres. Maybe if it’s noise reduction people want someone should do something about the appalling roads and the cheap tarmac used on them? And, as for efficiency surely the best way to reduce resistance is to reduce grip (that also reduces noise) and less grip doesn’t always sound like a good idea to me! However, there is clearly a lot more to this than simply designing tyres that grip less and run quieter; tyre science really is just that, a very scientific process indeed. Whilst every car is different, every journey different and way we all drive cars different there has to be some way of measuring the different grades. That’s not always easy and you may not notice it much yourself but there are some general guides available. For example the difference between an A rating and a G rating could mean a reduction in fuel consumption of up to 7.5% for an ‘average car’. That’s about 6 litres of fuel every 1000 kilometres which is not a lot to be fair. But for a thirsty GT-R os Skyline the savings could be more. For wet stopping, a passenger car applying full brakes from 80kph, a set of A-rated tyres will brake up to 18 metres shorter than a set of F-rated tyres. Again, not ideal for our readership as we tend to drive big, heavy cars but ones that have exceptional handling and very aggressive brakes. But you get the idea. The only trouble is, it’s a trade-off. More grip, better stopping equals less efficiency and usually more noise. Less grip, possibly quieter tyres, means longer stopping distances but greater fuel savings. The GTROC has recently signed a deal with Toyo Tires to distribute R888s for Nissan GT-Rs so it will be interesting to see what these tyres are rate at. Perhaps more interesting however will be the upcoming tyre test we will be conducting on these tyres before reporting back to Toyo on our findings. For GTROC members this is going to be something of significant interest, particularly to track day enthusiasts. As for Toyo Tyres, they too are looking forward to the test results! Watch out for this soon. The Ultimate Remote Control GT-R!